This is the first election in Nigeria that political thugs will block the road to a pulling unit in a bush, about 100 voters will gather together in a place because they are afraid of passing due to beatings by political thugs and the Police will even tell a Journalist to "leave this place if you love your life", just to give the APC a clear way to allow only people who have been bribed by the party to vote and they write the result of their choice. INEC has declared the candidate of the All Progressives Congress, Gboyega Oyetola, as the Governor-elect of Osun State. The rerun of the Osun State governorship election was held in seven polling units across four council areas on Thursday. 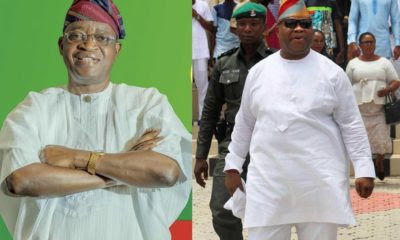 The returning officer, Prof. Joseph Fuwape, declared that the APC candidate, Oyetola, won the governorship election by scoring a total number of 255,505 votes while Adeleke of the PDP polled 255,023 votes. This was, however, met with protests by Adeleke, the PDP, and the Coalition of United Political Parties, among others. Adeleke had won the main election on Saturday with 353 votes after polling 254,698 against Oyetola’s 254,345. The rerun was held in one polling unit in Oyere in Ife-North, one polling unit in Olode in Ife-South, another polling unit in Osi, Ife-South, three polling units in Orolu, Kajola Local Government Area of the state and one polling unit in Osogbo. In Oyere, APC had 126 votes while PDP had two votes. In Olode, APC scored 283 votes with the PDP scoring 15 votes. In Osi, APC had 172 votes while the PDP had 21 votes. In Ifon, Orolu, APC had 111 votes against PDP’s three votes. In Gbogbo, Orolu, APC had 41 while PDP scored 64 votes. Also in Idiya, Orolu, the APC scored 128 votes against the PDP’s 55 votes. In Osogbo, the APC scored 299 votes while the PDP scored 165 votes. In all, APC scored 1,160 to beat the PDP which scored 325 in the rerun. When added to the result of the main election on Saturday, APC had a total of 255,505 votes against PDP’s 255,023. In the run-up to the rerun of the election, the PDP alleged that INEC shortchanged its candidate in some of the council areas by announcing figures that were lower than what Adeleke actually scored. PDP declared that the actual margin of the win against Oyetola in the first election was 4,740 and not 353. The party said that INEC added 2,000 votes to what the APC polled in Osogbo and 1,387 to what it scored in Olorunda. The party also alleged that 1,000 votes were deducted from what Adeleke scored in the Ayedaade council area. In areas where the rerun was held in Ife-South and Ife-North, PDP supporters said that they were barred by thugs from reaching the polling units to cast their votes for Adeleke. They also alleged that police watched as they were beaten by the thugs, adding that the result of the election did not reflect the wish of the electorate. In Olode, the PDP agent was absent at the polling unit. The Punch correspondents who were at the polling unit witnessed the beating of two people who claimed that they had come to vote. Although there was a heavy presence of armed security men at the unit, the hoodlums beating peole acted without hurdle. It was also observed that voters were hugely induced to vote at the polling unit.